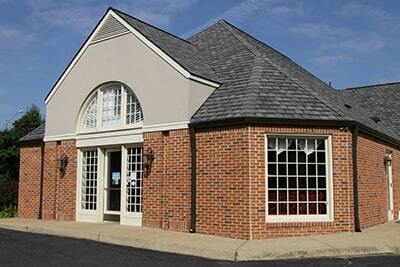 Old Dominion Animal Hospital is located in a standalone building near Downtown Charlottesville. Our drop-off services make it convenient for you to leave your pet with us during the day, while you’re at work, and then pick them up on your way home. Your veterinarian will be available in the evening to discharge your pet and discuss your pet’s visit with you. Lots of glass in our entrance makes for a warm and cozy reception area, where coffee, tea and waters are always available for your pleasure. We have four examinations rooms where you can meet with our veterinarians, with one room designated as a “quiet room.” This room is set up to feel more like a family living room, with a rug on the floor and dimmed lighting. It can be used for animals who are particularly afraid of the veterinarian’s office, for behavior consultations, and for difficult quality-of-life discussions, by offering a calmer, more home-like setting. Behind our examinations room, we keep a fully stocked pharmacy to meet your pet’s immediate medical needs, and a veterinarians’ station where doctors make return phone calls to answer all your questions about your pet’s health care issues. In the back of the hospital, Old Dominion Animal Hospital’s surgical suite looks and runs like a human hospital surgical facility. Our veterinarians use the safest anesthesia available, and have heart and pulse monitors, a surgical laser, and digital radiography viewers right there helping us provide exceptional care. Our treatment room is set up to allow for routine functions and dentals, as well as for critical or emergency procedures. Our in-house laboratory is only steps away for almost immediate results when time is of the essence. We also have a separate isolation room, cat and dog hospital rooms, and a digital radiography suite. 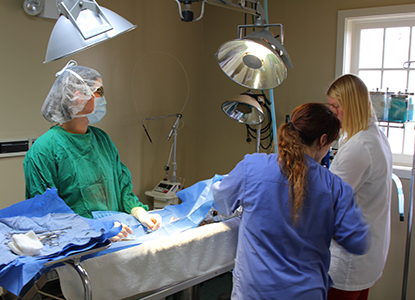 While we want you to know that our Charlottesville animal hospital is fully equipped to meet your pet’s medical and surgical needs, we believe it is our staff and veterinarians that really make us special! Come by and see for yourself why we’re so proud of our team and our facility.